POPSUGAR, TheSkimm, Vulture, Surface Hotels and Tips on Life & Love are giving you a chance to enter to win an adventurous getaway vacation to Barcelona, Spain! 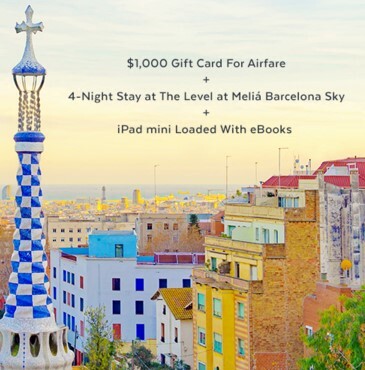 Prize consists of: (a) a gift certificate for four (4) nights in standard hotel accommodations (one double-occupancy room and room tax only) at The Level at Melia Barcelona Sky; (b) a $1,000 American Express Gift Card; and (c) an iPad Mini (16GB) ($269.00) pre-loaded with eight (8) ebooks of Sponsor's choosing ($12.99 value per ebook). Approximate total retail value of the Prize is TWO THOUSAND THREE-HUNDRED AND SEVENTY-TWO DOLLARS AND NINETY-TWO CENTS ($2,372.92) USD.